Wildwood Manor House was part of the estate of Robert Stranahan and his wife, Page. They lived in the 30,000 square foot mansion until 1968. The Manor House was built toward the end of the Great Depression for just $362,000. It was made of steel and reinforced concrete and the house has 35 main rooms, 17 bathrooms and 16 fireplaces. The formal garden was designed by landscape architect Ellen Biddle Shipman, one of the first female landscape architects in the country. She designed over 650 gardens throughout the eastern half of the United States. 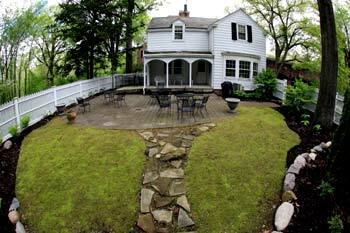 Metroparks is currently undertaking a complete restoration of the Manor House garden using the original plans. The interior of Manor House displays numerous period pieces in keeping with the Georgia architectural style including several original pieces that have been donated back to the property. When visiting, note the distinct differences between rooms associated with Mr and Mrs. Stranahan. The lower level entertainment rooms feature the typical furnishings any high end home of today would have with the surprising exception of the shooting gallery. In 1974, the Lucas County approved a 0.5-mill levy to purchase the 500+acre Stranahan estate for over $4 million with the goal of developing the property as a Metropark. Besides the Manor House, there is also 300 forested acres carpeted with wildflowers and ferns, and inhabited by small mammals, whitetail deer, fox and a variety of birds. Meadows and prairies provide habitat for other small animals and summer wildflowers. The natural features are best enjoyed from the extensive network of marked walking and all-purpose trails totaling over 11 miles. There is also an all-purpose paved trail that provides year-round use for cyclists, joggers and walkers. The Manor House is open for free, very informative guided tours Wednesday - Sunday 12:00 - 5:00. Just down from the Manor House is the Metz Visitor Center which open weekdays from 8 a.m. - 5 p.m. and weekends from 1 - 5 p.m.
Just east of the main entrance is the Farmhouse Gift Shop that was a Victorian farmhouse of the Albon family that farmed much of the land that now makes up Wildwood Preserve. Today, the farmhouse is the Wildwood Preserve gift shop that features Metroparks logo clothing, books, art, items for children, bird feeders and gifts. The Oak Grove School is an 1897, one-room brick schoolhouse originally located at Corey Road and Springbrook Drive. In 1998, the schoolhouse was moved 1/4 mile to its present location in Wildwood Preserve. The school is open some weekends and for special programs. It is located at the east entrance to Wildwood, near Corey. The two brothers, Robert and Frank, were at the right place at the right time in America's industrial development. At the beginning of the 20th Century, the automobile industry was just beginning. A Frenchman named Albert Champion moved to the US in 1904 and founded the Albert Champion Ignition Company in Boston in 1905 along with the Stranahan brothers. Robert Stranahan convinced the Willys-Overland Motor Company (later to be called Jeep), to use their replaceable spark plug for their cars. The only condition of the sale was that the Champion Ignition Company, had to manufacture the plugs in Toledo where Willys was located. So Champion setup a manufacturing facility there. Albert Champion was later forced out of the company, and he in turn set up the AC Spark Plug Company.